Painting Pink Pajamas: Our Favorite Board Games for Preschoolers (and the rest of the family)! Our Favorite Board Games for Preschoolers (and the rest of the family)! Little Sister just turned 4 years old, and Big Sister is 7. We own a lot of board games and we love to play. I know that a lot of families have a difficult time finding games that are developmentally appropriate for preschoolers, yet interesting enough for the rest of the family to enjoy as well. Here are our recommendations to keep your family game night running smoothly! The object: Players work together to get their Busytown characters to Picnic Island before Pig Will and Pig Won't eat all of the picnic food. Along the way, everyone has to work together to find hidden object in the game board. Why kids like it: Unlike many cooperative games, this one is actually fun! You battle a common enemy (well, not really, but you try to be faster than the hungry pigs!). Everyone gets to search for hidden objects, and the number found is the number of spaces that each player moves. And there is a spinner instead of dice. My kids love spinners. 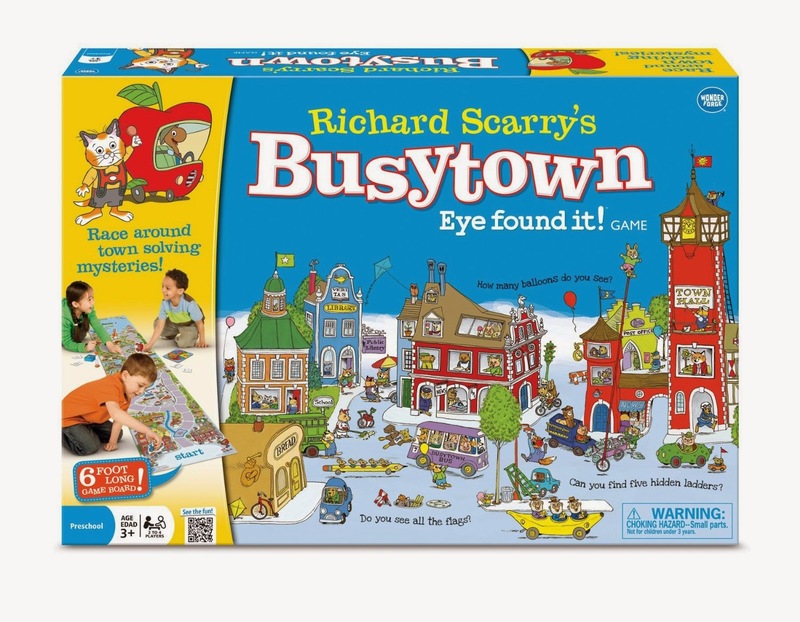 Why adults like it: It's not a terribly long game, and it IS actually fun, especially trying to find hidden objects before the timer runs out. The object: The monkeys are having a slumber party! Each player has a row of 6 cards face down in front of them. 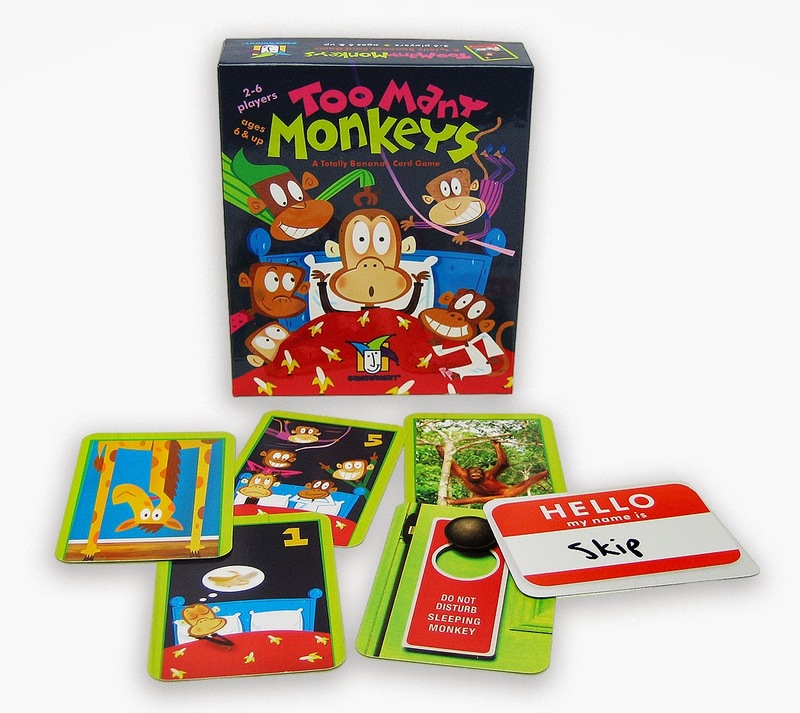 To win, you have to draw cards from deck and be the first to have an ordered row of monkeys (numbered 1-6) face up in front of you. Watch out for special cards that can help or hinder you. Why kids like it: It's a fast-paced game, with lots of special cards (wild card, skip a turn, turn over another player's card, root through the garbage pile for a card, etc.). There is very little skill involved - it's mostly a game of chance, so everyone is on a level playing field. Why adults like it: Explaining the game the first time is the trickiest part. After that, everyone catches on very quickly (kids and adults). Because the kids have just as good a chance at winning as the adults do, adults don't have to try to lose so they don't beat their kids every time (we've all been there, haven't we?). The object: Flip over cards to make sentences with silly actions for you to perform. The person with the most stars on their cards at the end of the game wins! Why kids like it: The game has very simple instructions, props, and they get to do silly things (and watch their parents do silly things)! Pre-readers will need help to read the actions. Why adults like it: It's easy to explain, and is short enough to play several rounds before moving on to a new game. 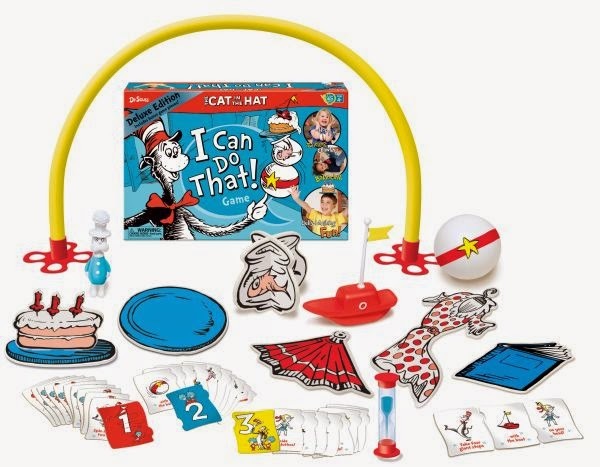 This game gets everyone laughing, and the smiles on your kids' faces will be priceless! The object: Spot It! includes instructions for a bunch of quick mini games. There is always one (just one) matching symbol between any two cards in the deck. Depending on the game you play, you either try to get the most or the least number of cards by calling out matching symbols. Why kids like it: It's fast paced and very easy to learn. In our house, this game elicits lots of shouting and giggles as the kids call out their matches! There are only 3 words on any of the cards (OK, STOP and ART), so it's easy for pre-readers too. Just take a peek through the deck before you play for the first time to show your kids the symbols and give them names (e.g. my kids had never heard of a yin yang before!). Why adults like it: It's lots of fun, and can be played by a bunch of players. You'll be amazed at how quick your kids can be at finding matches! The object: Roll the dice and put your coloured pegs on the numbered spaces of the wobbly game board. Try not to topple everything over! Why kids like it: Kids always like games where things can fall over & make a mess, don't they? Why adults like it: It's easy to explain, not a long game (have you noticed that is a theme here? ), and it's fun to see the kids' faces when the board topples over! 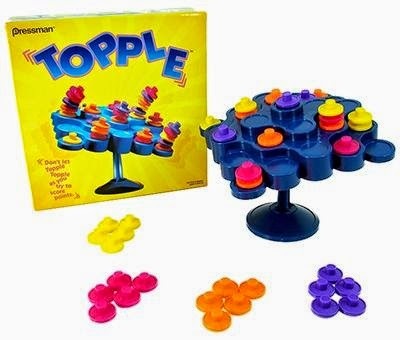 The object: Set the timer and put all of the shaped pegs in the appropriate holes before the timer runs out and the board pops, sending the pegs flying! Why kids like it: Most little kids like shape sorting. Some like the popping, others don't. Little Sister likes to put all of the pegs in, and then turn the timer on, so that she's not surprised by the pop. When I was a child, I liked trying to beat the clock. Why adults like it: This can be played as an individual or a team game. It's a fun break from a board or a card game, and it's fun to watch your kids jump when the timer pops! The object: Push your magician's apprentice around the board with a magic wand, dropping colored ingredients (marbles) in the matching cauldrons. The first person to get rid of their ingredients and "light" the fire wins! 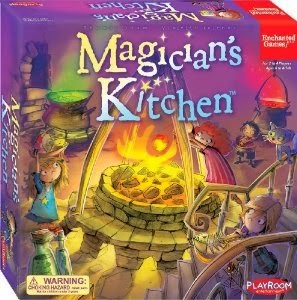 Watch out for hidden spells (magnets under the board) that will make you drop your ingredients! Why kids like it: Kids like seeing their characters pop the marbles into the cauldrons, and they like the unexpected element of the (magnet) spells. Why adults like it: This is a cute game, but pretty easy for adults, who can easily remember where the spells are. Remember to shake the board after every game to move the magnets to different spots. The object: It's a memory game with cute penguins and colored eggs! 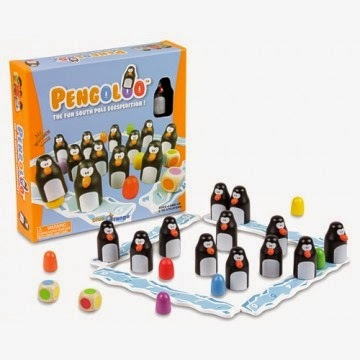 Roll the colored dice and try to find the colors you rolled.The person with the most penguins wins. But watch out, because your opponents can steal your eggs to make their match! Why kids like it:The penguins and eggs give this game a fun touch. Kids also like stealing eggs from someone who is in the lead! Why adults like it: It's another easy to explain game that is relatively short. You'll be amazed at your kids' memories (and your lack of it)! 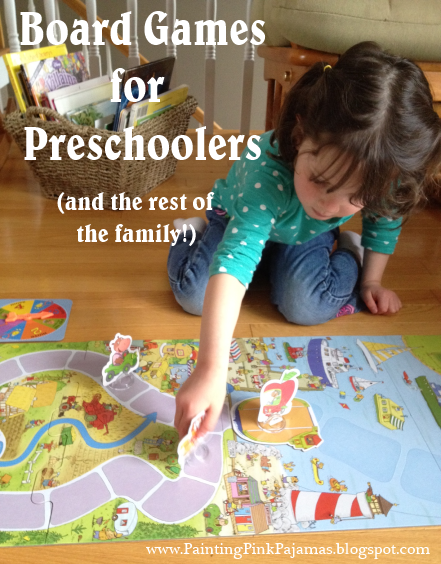 I hope you enjoy these recommendations for preschool-friendly board games! What are YOUR favorite games? 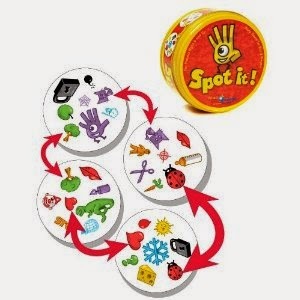 We love Spot It and Rush Hour. I may have to add a few of these to our collection! We love Spot It, too! And I totally remember getting so frustrated with Perfection. Great list.